"A fresh, easy way to use up your garden tomatoes. 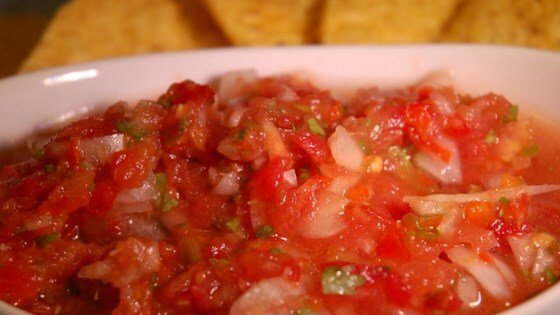 Mix and match different varieties of tomatoes for this salsa. It will keep well for several days in the refrigerator." This was my first attempt at making salsa, we loved it! The only change I made was using balsamic vinegar. Very good and I'll make again. This was exactly the recipe I was looking for to make homemade salsa with the tomatoes I grow in my garden! I added minced garlic and kosher salt for a little more flavor. Delicious!